Cook pasta as directed on box; drain. 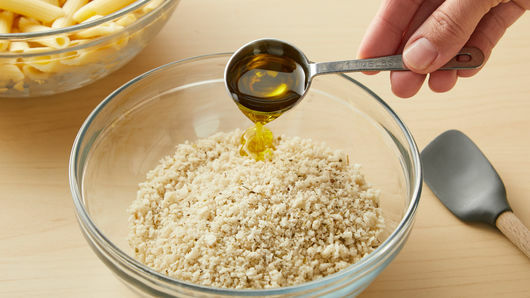 In small bowl, mix bread crumbs and olive oil; set aside. Meanwhile, in 2-quart saucepan, heat broth, half-and-half, garlic powder, salt and pepper over medium-high heat 2 to 3 minutes, or until mixture is hot and starting to bubble around edges. 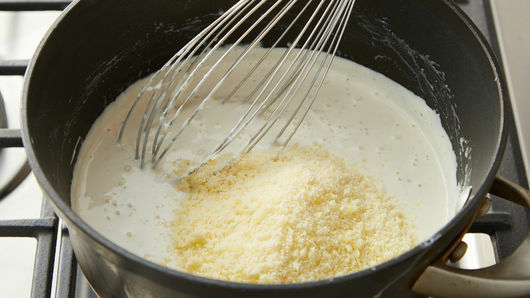 Add cream cheese; beat constantly with whisk 2 to 3 minutes or until cheese is melted. Remove from heat; add Parmesan cheese, beating until no lumps remain. 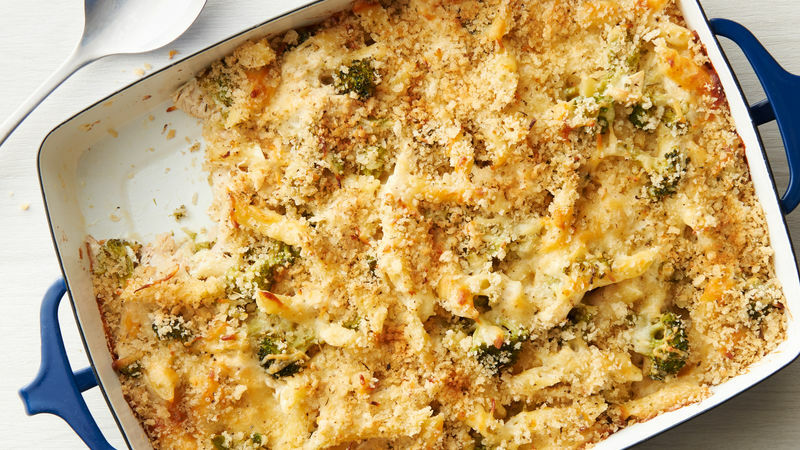 In large bowl, mix cooked pasta, chicken, thawed broccoli, 1 cup of the mozzarella cheese and the sauce mixture. Carefully stir until well mixed; transfer mixture into baking dish. Sprinkle with remaining 1/2 cup mozzarella cheese; top with bread crumb mixture. Bake 30 to 35 minutes or until heated through and bubbling around edges. Let stand 10 minutes before serving. Make sure broccoli is completely thawed before mixing, so you can drain any excess liquid if necessary. Neufchâtel cheese is sold next to regular cream cheese. It is made exclusively with milk, while regular cream cheese is made with both milk and cream. 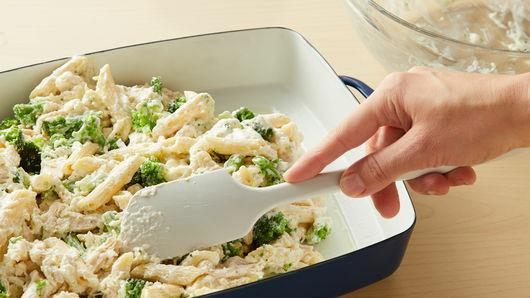 This recipe uses a scratch Alfredo sauce, as opposed to jarred sauce. You can use jarred sauce in a pinch, but note the nutritional values will change. If you have leftover rotisserie chicken on hand, that would work great in this recipe. Round this meal out with a side salad or Pillsbury™ crescent rolls.